Syria’s national crisis is gaining the world’s attention – finally. But why now – after several years of increasingly alarming headlines? The state structure may now collapse without outside intervention; Syrian national borders set in place in 1915 -1916 have become totally porous within the last few years; its citizens are fleeing in droves, causing a world refugee crisis not seen since the end of World War II; and as of late Sept. 2015, Syrian President Bashar al-Assad has control over only 25 to 30% of Syrian territory due to the increasing power of ISIS, the Sunni- extremist group which now claims a large swath of Syria and Iraq. No longer are the Syrian government’s brutal attacks on the rebels center stage, but also the violent actions of ISIS and its much flaunted and horrific beheadings. The ISIS civil and military operations are highly repressive, but also pragmatic and efficient. This has led to its rapid takeover of territories in both Iraq and Syria, among other regions, ruling over 10 million people in the process. This is a surprising outcome given major efforts to defeat them by far better financed and equipped Western military forces, led by the U.S. and Europe, while Russia and Iran have been backing Assad, who is also fighting ISIS. According to Amnesty International, the Syrian Civil War has forced nearly 12 million Syrians (or half the population) to leave their homes, half of them children. In 2013 the population of Syria was 22.85 million (World Bank statistics), but at least 7.6 million have been displaced within Syria, and more than 4 million have fled as refugees in neighboring countries, many of them living below the local poverty threshold. The numbers of refugees attempting to reach Europe started to increase exponentially in 2015, especially from Syria. Between Jan. 2013 and Jan. 2014, the number of Syrian refugees more than quadrupled up to 2.3 million. By mid-July 2014 the total number of Syrian refugees had reached 2.9 million, and as of late Sept. 2015 the number is now 4.1 million. This latest increase has closely coincided with the eclipse axis (Rahu and Ketu) transiting through Virgo and Pisces from July 15, 2014 to Jan. 9, 2016. We will examine the recurring theme of the Jupiter-Saturn oppositions in some key charts for Syria, and how the most recent Jupiter-Saturn opposition in 2010 and 2011 in Virgo/Pisces closely paralleled the start of the Syrian Civil War and is being triggered now by the current transit of Rahu and Ketu along the same axis, as mentioned. But first, we look at the Syrian national chart. General Hafez al-Assad (b. Oct. 6, 1930, d. Jun 10, 2000) was a Syrian air force pilot who had accumulated military and political power in Syria since 1958. He ordered a military coup that occurred just at dawn in Damascus on Nov. 13, 1970. It was a calm and bloodless military coup. Newspapers, radio and television stations suddenly disappeared, but otherwise the outside world was not aware of it. The new government was established within three days, and initially Assad had the role of Prime Minister. He became President on March 12, 1971, when he established a one-party state with a strong presidency, featuring the cult of personality. Hafez chose his successor, who was meant to be his eldest son Bassel, the “golden son” and heir-apparent until he died in a car accident Jan. 21, 1994. Bashar al-Assad (b. Sep 11, 1965) had been educated in medicine, not in politics and the military; and being far more introverted than his father and brothers, he was less comfortable in a leadership role. But from late Jan. 1994 onward he became the new heir-apparent and was systematically trained to take over the presidency upon his father’s death, which occurred on June 10, 2000. Astrologically, we note that the coup occurred less than four hours before an exact Full Moon at 27:02 Aries (conjunct Saturn retrograde at 25:33 Aries) in Bharani nakshatra and five days before an exact Jupiter-Saturn opposition at 25:07 Aries/Libra, with Jupiter at 25:07 Libra and Saturn at 25:07 Aries. This gives the Assad regime a particular resonance with planetary oppositions and the polarization they represent, notably the Jupiter-Saturn oppositions and their intrinsic meanings, both as planetary oppositions and in the zodiacal signs in which they occur. Within the 20-year Jupiter-Saturn conjunction cycles the most important event markers are the Jupiter-Saturn oppositions (180 degree aspect) that arrive 10 to 11 years after the conjunctions. The oppositions are defined by events coming to a crisis point, at which the issues of the era become very obvious, and more demanding of solutions. An opposition, like a Full Moon, helps us to see things more clearly, even if it is a confrontation of planets and of people. The time is auspicious to solve problems of the 20-year cycle or at the very least – identify the problems more clearly. In any case, we know from the astrological chart that Syria would be a strongly polarized country under Assad, even at the best of times. When Assad assumed the presidency on March 12, 1971, the planets were spread out over seven houses (a Veena yoga), showing a wide distribution of energy across a broad spectrum of life. This usually denotes prosperity as well. There was a Full Moon earlier that day at 27:24 Leo, the zodiacal sign most associated with royalty and the patriarch. Assad’s shift in power from Prime Minister to President was aided astrologically by the second Jupiter-Saturn opposition in this series, denoting further developments out of the events established at the time of the first opposition in Nov. 1970. This next and last Jupiter-Saturn opposition in the cycle occurred on June 11, 1971 at 5:43 Taurus/Scorpio, with Jupiter at 5:43 Scorpio and Saturn at 5:43 Taurus. This was a more favorable sign position for both planets, as Jupiter is not comfortable in Libra (the sign of its planetary enemy Venus) and Saturn is debilitated in Aries. Nevertheless, the chart establishing the current Assad regime appears to be the chart of the coup on Nov. 13, 1970, and is probably the most accurate national chart we can examine for Syria at the present time, and for as long as a member of the Assad family remains in power. The Assad regime of Syria is being severely tested at this time, and the chart for Assad’s military coup on Nov. 13, 1970 gives some strong indications as to why and when. The Ascendant of this chart is Libra, ruled by Venus, with Venus Retrograde, Jupiter and Sun in Libra in the Ascendant opposite Moon and Saturn in Libra. The coup occurred at dawn, which starts at 5:38 am according to rules establishing “Civil Twilight” as the start of dawn. A fixed sign might have been better for establishing stable long-term power, but having both the Full Moon AND the Jupiter-Saturn opposition across the Ascendant axis is an enormous boon to establishing a strong leadership. With Libra in the Ascendant there is a desire for harmony and a harmonious ideal and vision, even if the methods employed are forceful and militaristic. Even so, it was a bloodless coup. But Jupiter is the 6th house lord, and as such creates conflict for Venus when placed in a prominent position, as here. As planetary lord of Vishakha nakshatra, where Venus, Jupiter, Sun and Ascendant all reside, Jupiter has more power than is comfortable for a Libra Ascendant. And when Jupiter becomes prominent by transit or Dasha, it creates big problems for the regime, which is always working to contain conflict in any case, even if it pretends otherwise. Hafez al-Assad’s health began to deteriorate in the late 1990s, as of Rahu Dasha (from August 27, 1996) for the Syria national chart. This Rahu Dasha has some weakness due to Rahu’s placement in Dhanistha nakshatra, ruled by Mars, which is weak in the 12th house, while Navamsha Rahu in Scorpio is afflicted in the 8th house with Moon and Saturn. At his father’s death Bashar al-Assad assumed the Syrian presidency on June 10, 2000. This was just two weeks after the Jupiter- Saturn conjunction at 28:52 Aries, and during Rahu-Jupiter sub-period. The Jupiter-Saturn conjunction gave some power to Bashar’s regime, but the sub- period of Jupiter hinted at some instability to come. The 16-year Jupiter Dasha then began on August 27, 2014, at the height of civil war hostilities, increasing successes for ISIS, the so-called “Islamic State” within Syria and Iraq, and the increasing number of refugees fleeing Syria and even the surrounding refugee camps, which were becoming underfunded. 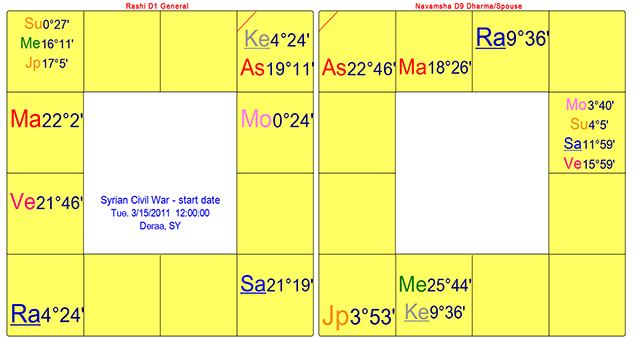 The last sub-period of Rahu Dasha, Rahu-Mars, is typically challenging, and is famous for removing what was given at the start of the 18-year Dasha (from Aug. 1996). 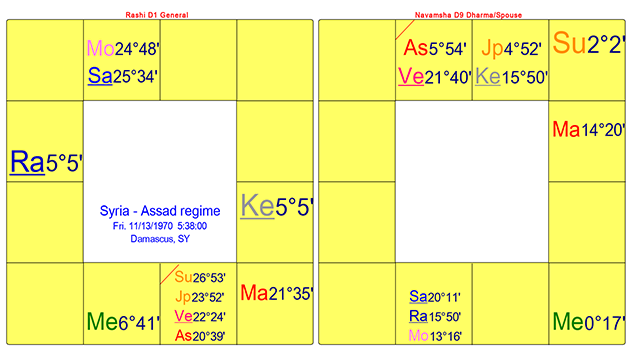 The Syrian national chart was running Rahu-Mars period from Aug. 9, 2013 to Aug. 27, 2014. In the midst of this sub-period was a Total solar eclipse on Nov. 13, 2013 at 17:12 Libra. This would not augur well for Bashar al-Assad’s regime over the following year, in which he saw his international reputation increasingly attacked, with threats from the U.S. and European nations that he should step down and/or be tried for war crimes. His chief political and military support has come from Russia and Iran. To go back a few steps, it is important to understand that as Syrian President, Assad is a Shia-affiliated leader, when the majority of the populace is Sunni. Even so, the Alawites are not quite Shias, being a more rare and controversial minority group and thus considered outsiders to some degree even by Shias. So the Assads (both Bashar al-Assad and his late father Hafez al-Assad, in power from 1970 to 2000) have chosen to rule with an iron hand to enforce their dictatorships, even if they claim benign and more secular rulerships. But loyalty to fellow Alawites was crucial, and Hafez al-Assad promoted his supporters within the Ba’ath Party. Once the coup occurred, Alawite strongmen were installed, and Sunni, Druze or Ismaili Muslims were systematically arrested and purged from the army and the Ba’ath Party. When the “Arab Spring” arose in early 2011, this would be a potent factor in the historical and political backdrop. The Syrian Civil War began on March 15, 2011, when protestors in the town of Deraa demanded the release of political prisoners. The Syrian government responded by shooting them dead, triggering violent unrest that spread nationwide over the following months. Into this mix the Sunni-extremist group ISIS capitalized on the growing anger of Sunnis in both Iraq and Syria. They were displaced by the American invasion of Iraq in March 2003 and the Shia puppet government in Iraq set up by the U.S. Meanwhile Sunni Muslims were always the majority of the populace in both Iraq and Syria, despite the dominance of the Shiite Assad regime since 1970. At the same time, the vast majorities (90%) of Muslims around the world are Sunni, and Sunni Saudi Arabia has been strongly supported by the U.S. since the Reagan era (1981-1989). Astrologically, the Syrian Civil War (from March 15, 2011) was preceded by a powerful Total solar eclipse on the Winter solstice, for the Northern hemisphere, on Dec. 21, 2010. At 5:19 Gemini, it was closely opposite the Galactic Center and within a few degrees of the USA chart Ascendant at 8:59 Sagittarius, hinting that the U.S. could be very involved in the upcoming events in the Middle East. Within two weeks of the start of the Syrian Civil War there was the second and last of the Jupiter-Saturn oppositions, exact at 20:20 Pisces (Jupiter) and 20:20 Virgo (Saturn) on March 28, 2011. In the chart of the Syrian Civil War, time unknown, thus 12 noon used on March 15, 2011, the most important factor is the Jupiter-Saturn opposition – a recurring theme from the Syrian national chart of Nov. 1970. But also noteworthy is the Graha Yuddha (Planetary war) between Mercury and Jupiter in Pisces, in Revati nakshatra, owned by Mercury, which loses the war to Jupiter and is debilitated in Pisces, though achieves Neecha Bhanga Raja yoga (some correction) through its contact with Jupiter. This means that communications and information in general become confusing and overwhelming due to the massive amount of it (Jupiter’s influence on Mercury, both in a water sign, creating expansion); conflicting reports and confusing terms (Pisces, dual water sign, and depleted Mercury), especially related to the various sects and tribes, their proper affiliation with Islam (Pisces and Jupiter in Pisces); and how exactly does one differentiate between so-called “moderate rebels” and rebels who should not be trusted or who belong to terrorist groups, such as al-Nusra, the al-Qaeda in Syria. Some of that has to do with the long-term resentment from Syrians controlled since 1970 by a Shia-affiliated leader when the majority of the populace is Sunni. Even then, the Alawites are a controversial minority even among Shias. But even further confusion comes in the last few years with the incursion of ISIS, the so- called “Islamic state” into Syrian and Iraqi territory, and its bizarre mix of brutality combined with piety, horrifying many Muslims worldwide and attracting others, including at least 30,000 young foreign fighters arriving in Syria as of Sept. 2015 from many countries around the world, both rich nations and poor nations. With the final withdrawal of American troops from Iraq Dec. 18, 2011, ISIS began its invasion of Syria and elsewhere. Though American troops returned in June 2014 to defend Iraq from ISIS, the strength of ISIS only intensified and complicated a Syria already weakened by a civil war seemingly without end and with no solutions. In May 2015, ISIS captured Palmyra, Syria and Ramadi, Iraq (300 miles apart). After U.S. forces killed the first ISIS leader Zarqawi in 2006 they thought they had diminished ISIS once and for all, but they rose again and again, seemingly inexplicably. The Syrian crisis has become so extreme that as of fall 2015 many national leaders are moving towards trying to find a joint solution. For the first time in 10 years Russian President Vladimir Putin is attending the United Nations General Assembly in late Sept. 2015. Having backed Syrian President Bashar al- Assad since the start of the Syrian Civil War, both militarily and politically, Putin has consistently maintained that the only road to peace in Syria is to support Assad and organize a major campaign against ISIS. Meanwhile, the U.S. and its allies in Europe have insisted that Assad has to step down. France is adamant about this, but the U.S. and U.K. are most recently showing signs of being more open to Putin’s new plan, which is of course the plan he has been proposing for several years. But part of it will involve conquering ISIS, and the major challenge is how to achieve that without decimating the remainder of the Syrian population and its infrastructure, already severely compromised. Putin’s plan fits perfectly with the Syrian Civil War chart and its dual sign intensity and potential for shifting gears (six planets in dual signs, with four across the Virgo-Pisces axis). If Putin’s plan is carried out, it completely reverses the course of action many Western nations had thought they should take, as now the new and worse-case enemy seems no longer to be Assad, but ISIS. And since Assad is fighting against ISIS, he should be supported. Assad, in turn, will have to compromise with his enemies, such as Western nations who have sought to remove him from power. This fits well with the Syrian national chart – Assad regime, in which Jupiter plays a major role for 16 years as of Aug. 27, 2014. It was from this time that the refugee crisis spiraled out of control. Previously, in March 2013, Syrian rebels seized Raqqa (one of Syria’s larger cities), and ISIS captured it from the rebels in June 2013, making it their headquarters in Syria shortly before taking Mosul, Iraq in June 2014. This seems to be the way to interpret this Jupiter Dasha for Syria, as it will either cause Assad to be removed from power completely, or the Assad government has to make some severe compromises that may not fit with its previous vision of how it wanted to lead the nation. Either way, it is hard to see how Bashar al-Assad will regain control over all of Syria, with its previously established borders from 1915-1916. The Full Moon eclipse Sept. 27, 2015 at 10:35 Pisces, in Uttara Bhadra nakshatra has brought the Pope to the United States and to the United Nations, urging tolerance, compromise, and compassion for those less fortunate and those not sharing our opinions or beliefs. Perhaps once bitter enemies Russia and the U.S. can find a way to work together to help bring the Syrian Civil War to an end. It cannot get much worse for millions of Syrians. Meanwhile, current focus on Virgo-Pisces matters keeps us looking at who is the victim and who is the savior, who is the servant and who is the master, who is the true believer and who is the infidel, and how much is fairness or integrity involved in any of this.